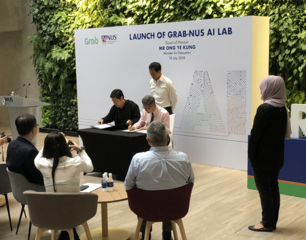 18 July 2018: The Grab-NUS AI Lab has been launched and set up as a joint lab between Grab and NUS. It is Grab’s first major AI laboratory and NUS’ first AI laboratory with a commercial partner. The Media Management Research Lab is leading one of the five sub-projects that is focusing on Location AI technologies. More information on the launch can be found in the press release.